The pancreatic duct, or duct of Wirsung (also, the major pancreatic duct due to the existence of an accessory pancreatic duct), is a duct joining the pancreas to the common bile duct to supply pancreatic juice provided from the exocrine pancreas, which aids in digestion. The pancreatic duct joins the common bile duct just prior to the ampulla of Vater, after which both ducts perforate the medial side of the second portion of the duodenum at the major duodenal papilla. There are many anatomical variants reported, but these are quite rare. The duct of Wirsung is named after its discoverer, the German anatomist Johann Georg Wirsung (1589–1643). Most people have just one pancreatic duct. However, some have an additional accessory pancreatic duct, called the Duct of Santorini. An accessory pancreatic duct can be functional or non-functional and may open separately into the second part of the duodenum  which is dorsal and usually (in 70%) drains into the duodenum via the minor duodenal papilla. In the other 30% it drains into the main pancreatic duct, which drains into the duodenum via the major duodenal papilla. 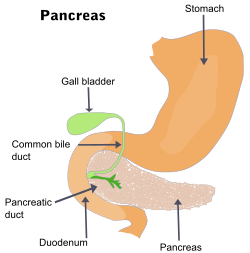 The main pancreatic duct and the accessory duct both eventually—either directly or indirectly—connect to the second part ('D2', the vertical segment) of the duodenum. It is named for Giovanni Domenico Santorini. Compression, obstruction or inflammation of the pancreatic duct may lead to acute pancreatitis. The most common cause for obstruction is the presence of gallstones in the common bile duct, a condition called choledocholithiasis. Obstruction can also be due to duodenal inflammation in Crohn's disease. A gallstone may get lodged in the constricted distal end of the ampulla of Vater, where it blocks the flow of both bile and pancreatic juice into the duodenum. Bile backing up into the pancreatic duct may initiate pancreatitis. The pancreatic duct is generally regarded as abnormally enlarged if being over 3 mm in the head and 2 mm in the body or tail. Pancreatic ductal carcinoma is a common form of pancreatic cancer. Pancreatic duct Deep dissection.Anterior view. Ultrasonography of a dilated pancreatic duct (in this case 9mm) due to pancreatic cancer. ^ Goel, Shivi; Rustagi, SM; Saha, S; Mehta, V; Suri, RK; Rath, G (July 2015). "Aberrant pancreatic ductal organisation: a case report". Surgical and radiologic anatomy: SRA. 37 (5): 543–6. doi:10.1007/s00276-015-1474-z. PMID 25840941. ^ doctor/2941 at Who Named It? ^ Moore KL, Dalley AF. 2006. Clinically Oriented Anatomy. 5th Ed. Lippincott Williams & Wilkins. p 287. ^ 1. Mchonde GJ, Gesase AP. Termination pattern of main and accessory pancreatic ducts among Tanzanians. Anatomy Journal of Africa. 2014; 3(1):223–227. ^ synd/3087 at Who Named It? ^ Moore, Keith L.; Dalley, Arthur F. (2006). Clinically Oriented Anatomy, Fifth Edition. Lippincott Williams & Wilkins. p. 287. ISBN 0-7817-3639-0. ^ Edge, Mark D (2007). "Clinical significance of main pancreatic duct dilation on computed tomography: Single and double duct dilation". World Journal of Gastroenterology. 13 (11): 1701. doi:10.3748/wjg.v13.i11.1701. ISSN 1007-9327. PMC 4146949.